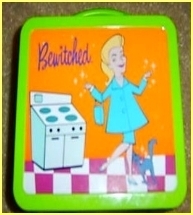 Bewitched lunch box. This are not vintage as there were never any Bewitched lunchboxes made in the '6os. This is kwa Vandor brought out in late '90s - early 2000.. Wallpaper and background images in the Lunch Boxes club tagged: bewitched tv series lunchbox photo.